Home of the Miami-based blues rock band. King Bee’s music video wins Audience Award at the Florida Music Festival’s Independent Film Jam! King Bee won the audience award at the FMF Indy Film Jam. Check out the video in the video section. King Bee selected to play FMF 2009! King Bee has been selected to play the 2009 Florida Music Festival in Orlando, FL. We’ll be showcasing along with many other bands at the same festival that has featured Black Tide, Flogging Molly, Seven Mary Three, Mofro, Less Than Jake, The Academy Is, Third Eye Blind, Buckcherry, Everclear, Lit, Dishwalla and many more. We’ll keep you posted on our actual showcase date, location and time. For now, if you’d like some more info on FMF2009 click here. King Bee makes it to the Final Showdown! Come out to the final showdown! King Bee makes it in as a New Time's Pick. We are very grateful and will play our hearts at at the final showdown. See you there!Check out the Tour Section for details on the show. Battle now for NYC showcase! Langerado is gone, but the battle is still on. Now with an even bigger carrot being waved in our faces. A chance to showcase in NYC! Please VOTE!!! and come out the the show. Friday, February 13th at Gulfstream Park. 9pm. Check the show calendar for details and directions. King Bee finalist in New Times’ Langerado Battle of the Bands!!! King Bee has been selected as a finalist in the New Times’ Langerado Battle of the Bands! We’re really excited to have this great opportunity, but we need your help. You gotta come out to the show and support. 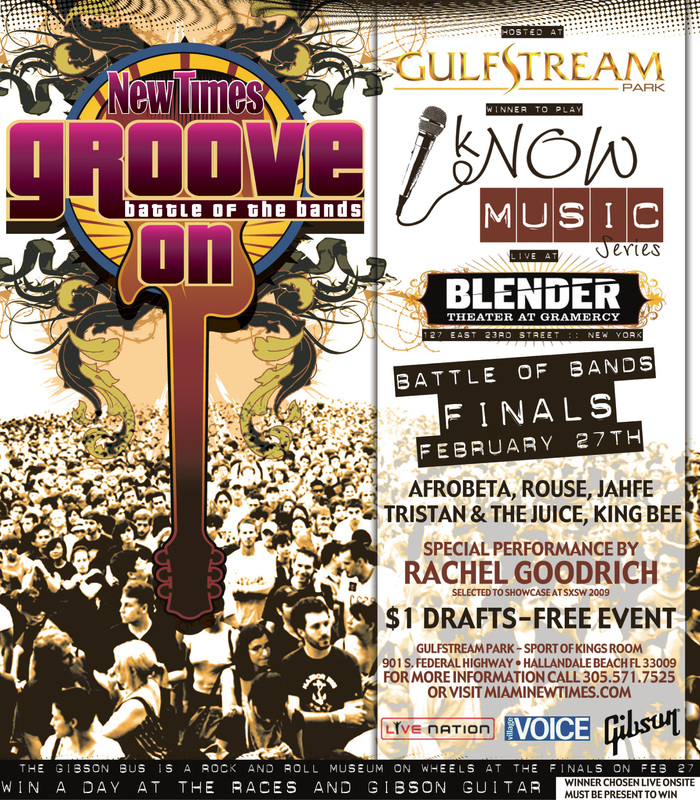 Also visit http://www.miaminewtimes.com/polls/battleofthebands/ and vote for us!!! It’s all part of the game. The more votes, the more chances we have of winning! King Bee will be performing, in competition, on February 13th (FRIDAY THE 13TH!) at Gulfstream Park. King Bee – Balls (music video shot on RED) from Pete on Vimeo. We finally made a Music Video. It’s for an untitled song off the 3rd album which should be out by Summer of 2009. We had a great time making it. Hope you enjoy!